Circleville is about 2 miles down the road from the NROCKS Welcome Center. The town has one gas station and also owns the historic Circleville School, built in 1937! Riverton is about 10 miles away and has the second closest gas station (Rivermart) to NROCKS Welcome Center! (30 minutes): Franklin is about 30 minutes away from NROCKS. The town has a bowling alley, a grocery store, and a few car repair options. which played a key role in the civil war. It’s also home to one of the most scenic sections of flatwater (the South Branch of the Potomac) on the East Coast. The town has a few car repair options, and a grocery store. (1 hour): Moorefield is about 1 hour away and has many rainy day activity options because it has a bowling alley and a movie theatre. Moorefield is also home to a Wal-Mart and has a plethora of car repair options! If you climb the Via Ferrata at NROCKS you’ll actually be able to see a lot of the Monongahela National Forest (locals call it “The Mon”). This forest is one of the bigger national forests in West Virginia and offers excellent birding, hiking and mountain biking! Located in the center of Seneca Rocks, Harpers Old Country Store is one of the oldest operating stores in West Virginia. The interior is much the same as it was in 1902 with a lot of the original building supplies still in use. The shop is definitely worth a visit when you’re in the area. Located in the Monongahela National Forest, Spruce Knob is the highest peak in West Virginia. It was just named the best place to stargaze in the Blue Ridge Mountains by Blue Ridge Outdoors! The view from the Spruce Knob tower is incredible day or night, so make sure to check it out! Located a pleasant drive from NROCKS Welcome Center, Seneca Caverns offers a cave experience for every type of caving enthusiast, from beginner to the most experienced. 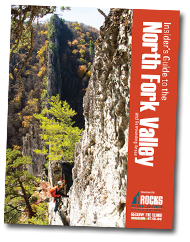 Whether you’re a beginner or an experienced trad or sport climber, Seneca Rocks Mountain Guides has a climb for you! The climbing school at Seneca Rocks offers many different classes and climbing options for every climber imaginable. Yokums, located in Seneca Rocks is an old country store that’s filled with goodies that you can bring home to friends and family after your trip. You’ll have a hard time convincing your friends not to come on your next trip after a trip to Yokums store. These caverns are named “Smoke Hole” because Native Americans in the area used to use part of the caverns to smoke their meat. That’s not the only historic role these caverns have had on the region! Book a tour to find out more. If you feel like throwing on a pair of skis, hitting a golf ball, or any number of other activities, Canaan should be on the list of places to visit! Greenbank Satellite Observatory (40 Minutes) – The NRAO in Green Bank operates the world’s premier astronomical telescope! They’re open year round so there’s no excuse not to visit this influential location! Timberline is the location of Timberzips, an NROCKS run zipline, but also has an extensive stable that offers rides, and a trail network that will keep even the most experienced skier or mountain biker busy for days! Home to one of the most famous falls on the east coast, Blackwater Falls State Park also offers extensive cross country ski trails, hiking trails, and many views that are worth the trip! Purple Fiddle is home to a café, a good selection of beverages, and a stage where you can find any number of homegrown artists playing most nights of the week. If you haven’t been to the Purple Fiddle, you need to plan a trip asap! This rafting company specializes in trips on the Cheat Narrows and Tygart river. They’ve got something for everyone when it comes to the whitewater world! Row, row, row your boat, gently down the stream! Ok, maybe not so gently because you’re likely to be on a class IV or V river, but the guides at PR know their stuff, and will make the ride as gentle as possible. You’ve never been whitewater rafting until you’ve taken a trip with Precision Rafting! Located just 3 minutes away from the NROCKS Welcome Center, Gateway has some of the best food in the North Fork Valley. Many of NROCKS guides rely on Gateway for Breakfast, Lunch, and Dinner, so you can rest assured that the food won’t slow you down on the Via Ferrata or Canopy Tour! Known for its view of Seneca Rocks, the Front Porch Restaurant is also known for its pizza and old timey atmosphere. Foxes Pizza is a local establishment that has pizzerias in Franklin, Brandywine and Petersburg, WV. Located in Davis, Hellbenders is known for its generous portions and laid back attitude! A wonderful resource for what’s going on in Pendleton County. Blue Ridge Online is the premier online welcome center for the Blue Ridge and Appalachian mountains of the eastern United States. Here you will find information about attractions, accommodations, outdoor activities, shopping and everything you need to make your mountain vacation the getaway of a lifetime. The premier, online source for a wide variety of current, accurate, and practical information about scenic, historic and cultural attractions in Virginia’s Shenandoah Valley. West Virginia’s Mountain Destination resource guide to West Virginia.